OGCA-Pre does not mail paper copies of proposals to a funding agency, if required. After OGCA-Pre has approved a proposal, it is returned to the unit. The unit makes copies and submits the proposal to the sponsor as needed. An electronic copy of the proposal will be kept on file in the OGCA Shared Drive. When the proposal is awarded by the agency, the proposal will be shared with the OGCA Post-Award team for account set up. OGCA-Pre is responsible for most recognized electronic submissions (except for email submissions as noted above and for other disparate electronic systems where the proposer is required to individually register and then can submit directly after OGCA-Pre approval). Some private sponsors accept electronic submissions as well. If your proposal must be submitted electronically, indicate that electronic submission is required on the Proposal Routing Form. The following example forms have been filled out with the correct information that should be in every proposal submission for Grants.gov. When in doubt, ask OGCA Pre-Award staff. 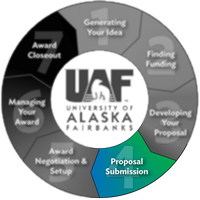 "Any administrative correspondence related to the official submission of this proposal should be directed to the University of Alaska Fairbanks, Office of Grants & Contracts Administration at uaf-ogca@alaska.edu. If the information is technical or programmatic in nature please forward to the Principal Investigator." "The parties understand that any developmental items and specially designed parts, components, accessories and attachments developed as part of this project are for both civil and military applications. University is a U.S. institution of higher education that conducts fundamental research (as defined in National Security Decision Directive 189 and Ashton B. Carter Department of Defense Memo date May 24, 2010) where results are widely and openly published and made available to the scientific and academic community." Only send documents that have been reviewed by OGCA as indicated in the proposal folder with the naming convention extension “Final”. When OGCA reviews documents in Word and Excel format for ease of review and editing, the documents will have to be converted to PDF before submittal to sponsor. OGCA will convert them to PDF copy and save as “Final” in the proposal folder as part of our review and approval process. If the sponsor requests a single file for e-submission, the filename should be tagged as “PROP” per the document type guidelines while following the rest of the naming convention.